It is in full swing, the exhibition “The World of Butterflies” in Sorrento, a very attractive festival where you can admire these colorful and friendly insects, which are present in the collective imagination since childhood. 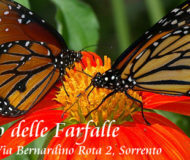 The event is held at Ruoppo Garden in Sorrento until February 5th and will allow you to admire the butterflies in all their stages in the transition from eggs to caterpillars and pupae, finally, into butterflies. Every day, from 9 am to 8 pm, including public holidays, you can watch thousands of species from around the world, at a price of only 5 euros per person and 3 euros per person for groups over 20 people. To reach Ruoppo Garden just go to Via Rota Bernardino 2 in Sorrento. Description: The event is held at the Ruoppo Family Garden in Sorrento until February 5th. Every day, from 9 am to 8 pm, including public holidays.